Casa Romero is a comfortable stylish villa, designed and furnished with a simple chic decor. The white walls and sleek polished concrete floors create a cool and calming space. This bright spacious casa is designed and laid out in a very similar fashion to Casa Lavanda, so if you are looking for a villa with style and grace, you will find it hard to choose between these two villas! This spacious villa is built over one level with a roomy relaxed vibe. The lounge has a comfortable couch, TV, and large sliding doors opening out onto the terrace. The kitchen/diner is open through from the lounge and is fully equipped including coffee maker, microwave and dishwasher. It is also furnished with a dining table that seats 6 people. There are 4 good sized double bedrooms, 3 with luxury en-suite shower rooms and 1 without a bathroom although there is a separate house bathroom. Casa Romero has air conditioning in all rooms, wifi internet, burglar alarm, and has a washing machine & dryer. The large terrace has a bbq, table with plenty of seating and overlooks the garden, infinity salt water swimming pool, and further out to La Mola. The garden is stocked with various bushes and trees typical of the Formentera countryside and is bordered by maturing olive trees to provide privacy. Casa Romero is in a nice location in the Cap Barbaria area, and is a peaceful place to relax and unwind. Close by are tranquil clifftop paths, ideal for walking or jogging and still are quiet in peak season. Cala Saona beach is a 10 minute drive away or a 5 minute cycle ride to the seas edge and a lovely walk along the cliff edges to the beach. The closest shop is at bar es cap 10 minutes drive away and also restaurants. 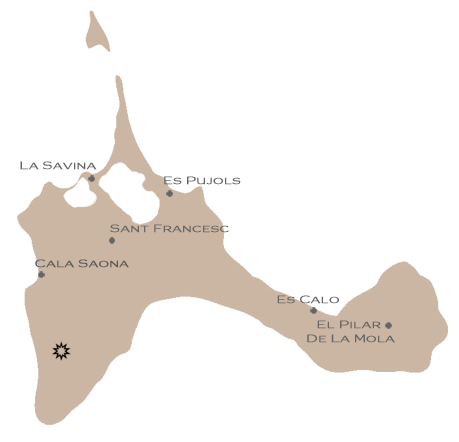 The nearest town is San Francesc, which is not far up the road for all amenities. The lighthouse of Cap barbaria is 3 km away.